The iKhaya Trust Centre was previously a beer hall. When it was destroyed in a fire in 2002, the GSDT turned it into a community centre. It now houses various partner organisations such as VisionAfriKa, VisionAfriKa primary school, SEED, Eduvate, AmaZink and the InZink amphitheatre. 2-22, an initiative started by GSDT, now under full management of VisionAfrika, is an all-inclusive educational and life-skills programme for learners from as young as 2 up to 22 years. SEED is an entrepreneur development and mentoring programme development and mentoring programme. The centre hosts regular theatre and poetry events, choir competitions, films and sporting events at AmaZink and the InZink amphitheatre. The Trust Centre was renovated in 2010 and for this renovation, the architects KR2, received a prestigious merit award from the South African Institute of Architects. 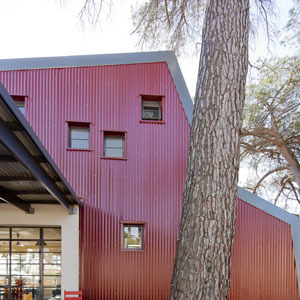 The Trust Centre also received a merit award from the Cape Institute for Architecture. “The iKhaya Trust Centre demonstrates how much an architect can transform the daily experience and social development of many people through one well designed building. The loose-fit geometries employed by Kr2 Architects achieve a range of internal and external spaces, each with a strong identity. This identity is achieved through built form rather than colour coding or naming, making it easy for both children and adults to fin their way around the set of spaces. The centre, formally a beer hall, has been transformed into a hub of education which allows for transfer of knowledge between all age groups by careful and exciting cross programming. The alterations and additions to the existing building took into consideration a range of age groups and uses that may change naturally as needs be over time. The physical manifestation of the varying degrees of interpretation is an inciting collection of spaces of different scales, sizes and location around a site with animated topography and beautiful distant views. Educational space is prioritised, but not in a sterile institutional manner. Peer learning and intergenerational learning is encouraged by classrooms that scale down to the height of tiny toddle, but these child spaces live comfortably and safely next to an eating space and amphitheatre where different age groups can come together. Proximity approximates and achieves a village-like atmosphere, and this feels like a very natural yet positively reinforcing extension of the surrounding township. The InZink amphitheatre at the Ikhaya Trust Centre is a popular venue for a variety of cultural activities. It has been used for screenings of sports events, films and opera; live music performances, including rock bands and classical musicians; and the monthly InZync poetry sessions, hosted by SLIP (the Stellenbosch Literary Project). The Greater Stellenbosch Development Trust is dependent upon sponsors and donations from individuals and companies who believe in supporting developing communities. Help us by donating items on our wish-list. Donate money to support the long term projects of the trust. Become a volunteer and become part of this vibrant and embracing community.